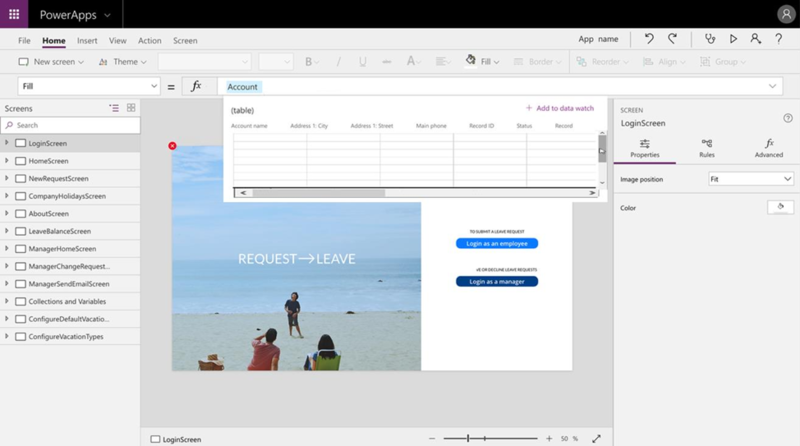 Many new features are coming for Microsoft PowerApps in 2019, most of which will be available with the April 2019 release of Dynamics 365. For those unfamiliar, PowerApps is a suite of application components, services, connections, and data platforming for rapid development of custom business applications that the common data service for applications or other sources such as SharePoint, Office 365, Dynamics 365, or Microsoft SQL. Here we’ll walkthrough the updates that will be included in the April 2019 release. Direct adding fields to the entity within the designer. Dragging of new columns into the field drawer. Adding advanced filtering in the property pane. Selection of columns for renaming of header and setting specific column widths. Canvas apps work using formulas which are formed from various functions composed together and then sent directly into controls. The assembling of functions can easily become complex and tricky to debug without resorting to creating and using debug controls to display results from various points in the composition. This new feature avoids this hassle of debugging by letting makers drill down into formulas and view the output of the subparts. Figure 1 – Early conceptual sketch showing the value of what is selected in the formula, in this case the data in the Accounts table. App makers who add complex and/or restricted entities to their canvas app may add additional licensing requirements on users who run it. For the April 2019 release, makers will now be notified of licensing impacts when adding such entities. App makers will now receive regular email or in-product reports about app usage by end users along with targeted recommendations on ways to improve experiences. Step-by-step guided help specific to frequent scenarios will be shown to App makers and admins. The Solution Checker that was available for preview in the October 2018 release will now be generally available. Improvements will be added for parsing and actings on PowerApps.com results and new performance and stability checks. Adding of fields and controls by drag and drop. 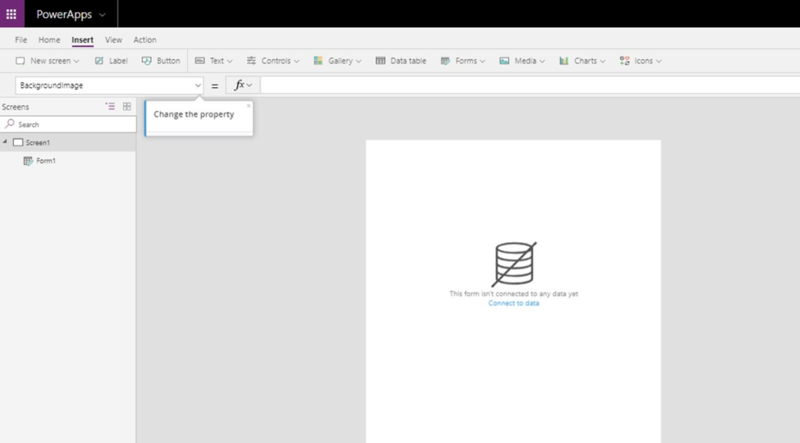 Creating Quick create, quick view, and Card forms. Adding Quick view controls and sub-grids controls to forms. Easier lookup and adding of custom controls to forms. Embedding of canvas apps in model forms (June 2019 Release). Canvas apps are normally scaled to fit the space provided by the host. While this is good for designing an app that looks correctly proportioned on the screen, it rarely allows for taking advantage of added real estate on larger displays effectively. To address this, a new responsive layout feature has been created and made available for public preview. The responsive layout feature allows app creators to create responsive canvas apps that use formulas to size and position controls, resize fonts, and change scaling based on the screen size available at runtime. This allows resizing of controls that can take advantage of increased space, such as text entry boxes or images, while leaving controls that do not need more space, such as buttons and text titles, at a lesser size. The feature is available for public preview in the February 2019 release with general availability likely in mid to late 2019. 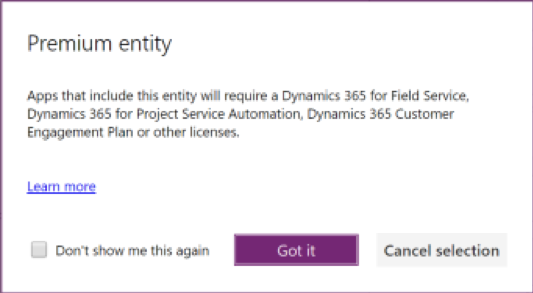 Androids and iOS device users of model-driven PowerApps can now login to Dynamics 365 using email addresses instead of URLs and access all available apps from their organization. You can now create preview environments from the existing production environment in the Power Platform admin center. This allows your organization to test and verify apps and solutions against updates in preview before they are deployed. This is supported for Dynamics 365 Customer Engagement, PowerApps, and Flow. Ability for mobile devices to reliably scan bar codes, QR codes, and data matrix codes. Support for showing of locations and routes on maps. Streaming video support in apps. Offline access of CDS data for model driven apps. Live profile cards, which are standard in Microsoft 365 applications, now include Dynamics 365 users and is available seamlessly in contact management through the Unified Interface. Data in the Common Data Service for apps can be shared through security groups in the Azure Active Directory. Simply create one or more custom security roles for entities and assign them to Azure security groups. Apps, flows, and entities can all be shared in the same security group. Solution support for canvas apps and flows has been improved since the October 2018 preview allowing for better tracking of dependencies, removing of apps when uninstalling solutions, moving custom connections into solutions, and adding additional canvas apps and flows to previously created solutions. Administrative support has been improved by providing a unified support experience to Power Platform admins on all apps and support plans. Through the Power Platform admin center, administrators can connect with Microsoft Support agents, get help on system-wide issues, and self-help recommendations on resolving issues. 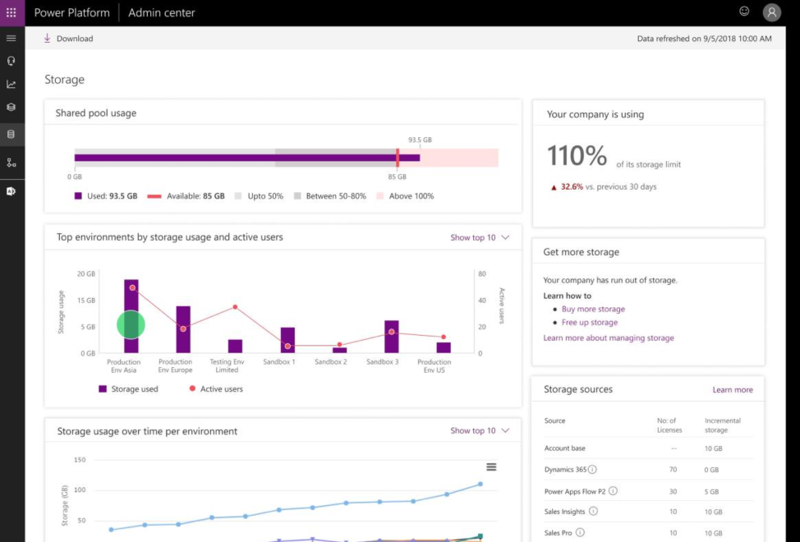 New reports are available for administrators to track storage consumption by Common Data Service apps in their organization for every environment. These reports automatically update on a routine basis and are available directly from the admin center. KTL Solutions is a Gold Certified Microsoft Partner. We provide customized software solutions, Office 365 support, eCommerce customizations, and integration with Microsoft Dynamics. KTL Solutions has the knowledge and experience to help with migration, deployment, customization development, and support for Dynamics 365. Our experience working with hundreds of clients will help your business succeed.